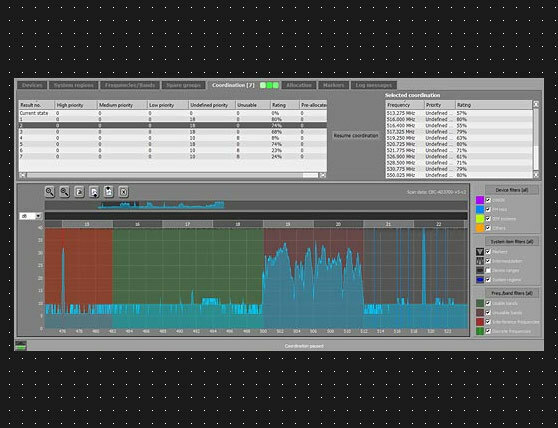 Sennheiser's Wireless Systems Manager is a professional software solution for remotely monitoring and controlling wireless systems. Its intelligent features make the WSM the ideal choice for TV studios, live events, as well as musical productions. 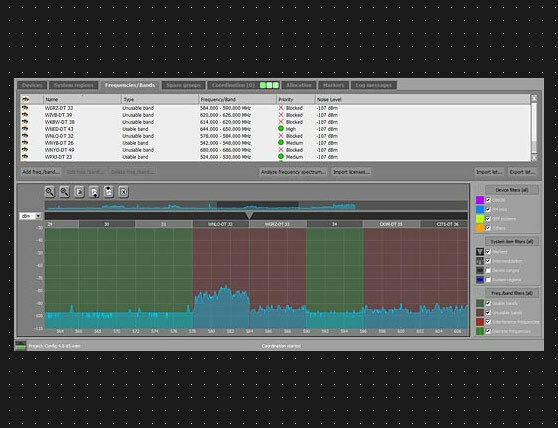 Wireless Systems Manager 4.4 for Mac and Windows assists users in setting up and coordinating the frequencies of wireless microphones and personal monitors by having the most important parameters handily displayed on a single screen. Frequency planning can be a complicated topic because many parameters need to be considered. Which frequency ranges are free and which are allowed to be used ? How many channels are needed and how many spares are necessary ? And which frequency ranges do the transmitters and receivers cover ? The new - completely reworked - graphical user interface of the WSM 4.4 professional setup provides a great overview of all these parameters in one screen. 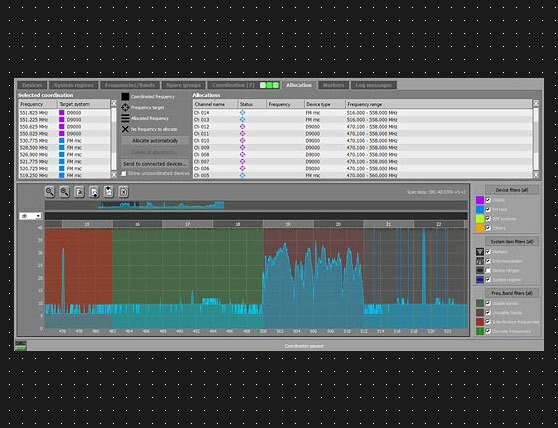 It’s a visual and intuitive tool for a solid frequency planning. Users can import lists with their licensed frequencies, which the software will use for planning the wireless set-up. Spectrum scans can also be imported, enabling RF engineers to plan off-site in advance of any event. All planning data can be exported and saved or e-mailed so once onsite, the RF manager can recall this data and transfer it to the devices. The Wireless Systems Manager displays the entire data of all controlled devices, and the spectrum scan is included on this screen and can be enlarged as desired. Within the spectrum scan, users can define system regions and control in-ear monitoring systems and wireless microphones on a single screen. The spectrum scan displays the frequency ranges of the Sennheiser systems and allows the user to set and name markers, for example to indicate the transmission frequency of the lead vocals mic. As before, users can determine a spare frequency group with alternative frequencies that can be used if a formerly unoccupied part of the spectrum suddenly turns out to be in use. The spectrum layout can be modified for every country in order to reflect the local LTE bands and occupied TV channels. As usual, frequencies can be assigned manually or automatically. The automatic frequency management uses a new algorithm that also evaluates the reliability of available frequencies. 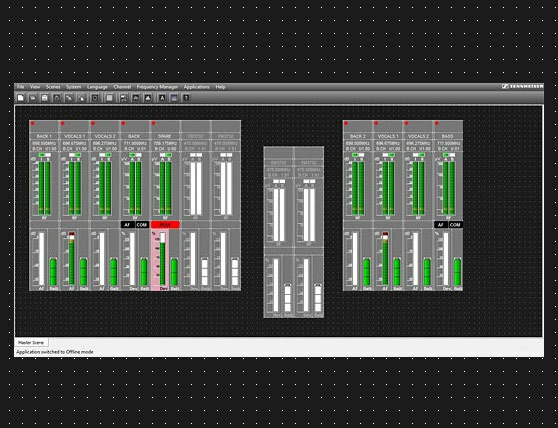 In version 4.3 you have the possibility now to monitor the audio stream of individual EM9046 channels directly in WSM. You can also now monitor the DANTE stream in WSM if you have EM 9046 DAN cards installed in your receivers. WSM is calculating frequencies in complex setups even faster than before. On the coordination result page you can see now the distances of each carrier frequency as well as the intermodulation spacings. If the recommended safety distances can not be met due to a dense enviroment, the result will be displayed in red color. The user can now decide if he allocated this more "critical" frequencie to a less important channel or if he choose a different calculation. To define the spectrum after a frequency scan in a fast and efficient way you can now select a noise threshold, defined by a red line in the spectrum chart. If the noise level is below this line, the spectrum area will be automatically defined as usable. If the noise level is above this line, WSM will block these areas and avoid them during frequency calculation. You will now have the possibility to lock already assigned frequencies on devices. During another frequency calculation this device (or devices) will keep their dedicated locked frequencies. All other frequencies will be coordinated "around" the fixed ones. This is a big help if you already prepared a full setup and only one device is changing or comes on top. You do not have to re-configure and do the coordination for all devices again.